It might not be the right method for everyone seeking a home loan -- it requires both a good credit score (798) and some singing and guitar-playing skills -- but it worked for one Georgia couple. 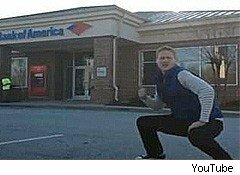 Ken and Meredith Williams' humorous music video, the centerpiece of a no-holds-barred social media campaign waged against Bank of America (BAC), convinced the bank to finally close on the couple's mortgage -- despite the lyric, born of frustration with a 72-day waiting period, "Don't let anybody tell you you're too big to fail/Cause you belong in jail." As AOL Real Estate's Teke Wiggin reports, Bank of America's social media team took note. Not only did the bank finally close on the $203,000 loan on Dec. 16 -- seven weeks after the Oct. 31 date given originally by a senior mortgage officer -- it also agreed to pay the $50-a-day late fees the couple owed to the seller. "CLOSED THE LOAN," read a triumphant entry in the Williams' blog, closeourloan.wordpress.com. "KEYS IN HAND. PER DIEM FEES PAID FOR BY BANK OF AMERICA." And a home for the couple's garden gnome at last. Watch the Williams' successful appeal below, and read more of the story at AOL Real Estate.